In recent years, my wife and I have tried to reduce the commercial aspect of the holidays by making at least some of the gifts for family ourselves. Given that I’ve been trying to get into woodworking a little bit, much of what we’ve made has been made from wood. This year, our gifts for our siblings and parents were a family effort. Inspired by a coat rack that Lisa’s grandfather had made, we made hat racks (the hooks aren’t maybe as strong as on the original model). I borrowed a router from a friend and got the wood from another friend who had some scrap pieces just the right size lying around. This was the first time I’d used a router. I did it free-hand, which made it just a little more difficult to keep everything level and straight, but I think in the end they turned out well. I used a different routing bit and/or different routing depths for each of the pieces. We then had our daughter write out everyone’s names in her unique 3-year-old script and I then wood-burned everyone’s names into the wood. 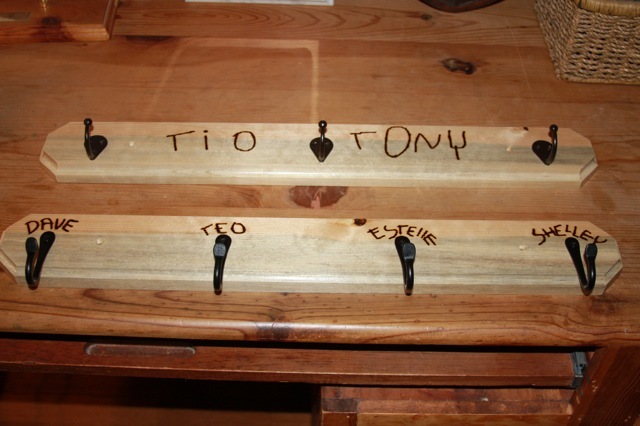 For each family, we gave each family member a different hook, with their name burned above their hook. For the grandparents, we put each grandparent’s name and then the names of all of their grandchildren (fortunately, our parents didn’t have as many kids as our grandparents, as we would have needed literally 6 foot long hat racks). Lisa finished them by varnishing them. We got the hooks at the local hardware store, going for a rustic look. The final products were not the most sophisticated things in the world, but I think they turned out nice. When we were at my parents’ house for Christmas, I hung up their rack, which fit perfectly behind their door. 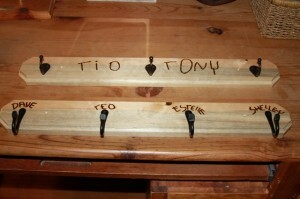 Now all of the grandkids have a place to hang their stuff when they visit amuma and txitxi! 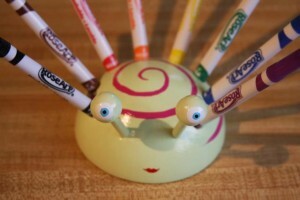 For all of the cousins and friends, we made more marker holders. A year or so ago, inspired by an image I’d seen on some blog, I made a marker holder that Lisa then painted to look like a ladybug. 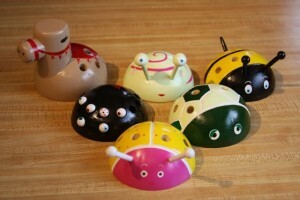 This year, we made 6 more, a camel, a snail, a bee, a spider, a turtle, and a bug. Lisa did a great job taking almost abstract lines cut into the wood with a Dremel tool and making them marvelous little creatures. The spider, in particular, I really liked, with all of it’s eyes doing all different things (this spider only has 6 eyes; while more than 97% of spiders have 8 eyes, there are a few that have 6). Our daughter uses her ladybug all the time, as it makes it super-convenient for her to have her markers out in a way where she can easily grab the color she wants. I hope the other kids get as much use out of theirs. For Lisa, I made a trivet. 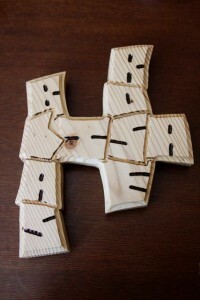 This was a bit trickier than the hat racks, as I made a relatively complex shape that incorporates our names. I used a sort of square font that I’ve played with since I was in grade school, using it in the past for various doodles and such. This seemed a perfect project to use it as I wanted a shape that was pretty solid and interconnected so that it would support a pot or pan. The lines between the letters were Dremeled out while the lines defining the interior of each letter were first Dremeled and then wood burned. The outside was routed. In the end, while it jumps out at me, I’m not sure the letters are very clear to someone who didn’t actually make the thing. I guess my initial piece of wood was not very flat as it doesn’t sit completely flat on the table. And the wood varnish I used maybe isn’t the best for very hot things (some pots have stuck to the varnish). Some things to think about next time. The last project was for our daughter. A couple of years back, while visiting Lisa’s parents, Lisa’s dad showed me how to use his lathe. Just playing around, I’d made a few little figures representing Lisa, me, and our daughter. This year, we expanded her little wooden family, with figures of grandparents, all of the cousins, and even a snow man and Santa Claus! There is still more family to do — we are debating whether to continue the expansion to her aunts and uncles — but I think at the very least I have to do a little wooden frog at some point. Lisa did a wonderful job painting these, giving them character and making the resemblance to their real-life counterpart very close. On the back of each one is that person’s name, so our daughter also has a way of learning how to spell everyone’s name. We’ve been sort of waiting until the last minute to get these done. The hat racks were literally finished just days before the last shipping day. 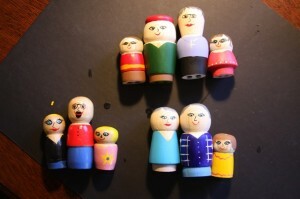 But, it is nice to make something, rather than buy some piece of plastic. Maybe we aren’t doing our part to support the economy (though the wood and other supplies do add up). But, I also think our economy needs a new basis besides just buying things. Not sure what we will do next year. I slowly keep expanding our shop, which gives me more flexibility in what to try to make. But my skills are still pretty novice and time is a factor. 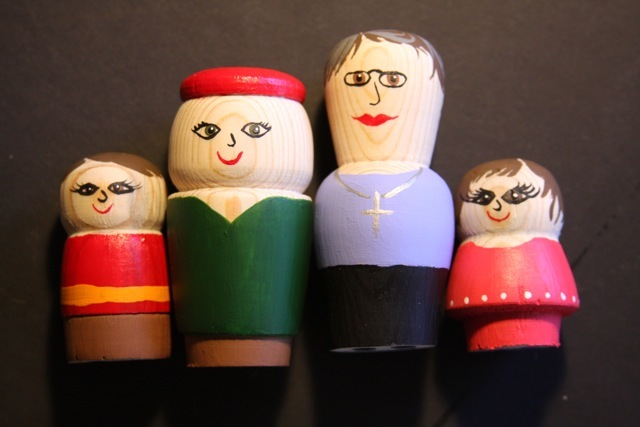 However, we’ve also turned to wood crafts for the party favors for our daughter’s upcoming birthday. More on that later. Sometimes (more often than not), I wait too long to get to writing about books I’ve read. I read Bursts by Albert László Barabási a few months ago, and having a memory like a sieve, I’ve already forgotten a lot of details. But, the basic idea is this: humans are more predictable in our behavior than we would ever expect. A truly random behavior is often characterized by Brownian motion, named after the guy who discovered it, a guy named Brown, of course. It was Einstein who understood it and it has become a mainstay of our understanding of how random processes occur, such as the motion of atoms in solids and molecules in liquids. If humans acted in a Brownian way, we could predict certain aspects of human behavior, such as the average time to move from one place to another, but not much more. It turns out that humans and our associated activities are not so Brownian — not so random — and we are more predictable than that. 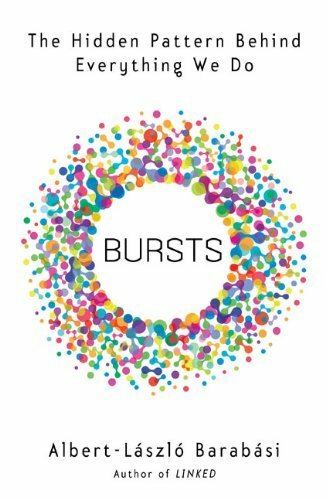 Our behavior follows “bursts”, in which our patterns are punctuated by long periods of relatively quiet activity followed by bursts of focused activity. 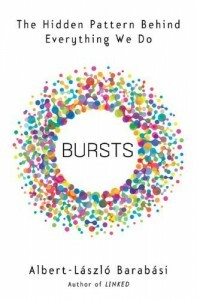 These bursts are indicators of non-random behavior. As an example, we don’t check our email at random intervals throughout the day. There are times in which we don’t check or answer email for a while, then sudden bursts where we fire off a number of emails in very fast succession. The same is pretty much true of everything we do, whether we are aware of it or not. This makes us much more predictable than we would think. In fact, Barabási says that if you give him details of your activity for about 2 months or so, he can predict with better than 80% accuracy what you will do in your day. Barabási spends a lot of time discussing the implications of this fact, from identifying terrorists (from abnormal behavior) or the fact that advertisers know better than us what we will be doing, and target us very effectively. Interspersed with his discussion of randomness is a tale from Hungarian history, the story of György Dózsa, a nobel who first was given command of a Crusade against the Ottomans which became a peasant revolt against the nobility of Hungary. I won’t spoil the end, but it is gruesome. Barabási weaves this story throughout his narrative as an attempt to show both how predictable and unpredictable history is. I’m not sure it works nor adds to the basic point of his book, but it is an interesting historical anecdote. I did learn something about a little known aspect of European history. If this guy had been successful in his revolt, Europe might have turned out very different. In the end, this book gives some very interesting insight into human behavior and points to the danger that companies and governments will know us better than we know ourselves. I already am wary of advertisers as they know our mental propensities better than us, knowing how to appeal to those parts of us that we barely are aware of. With the insight from work such as Barabási’s, they will also know our behavior, our activities and be able to predict what we are going to do. This kind of research offers fascinating new insight into what it means to be human, but also opens the door to more control of our lives. Jones is a new hire at Zephyr Holdings, a company in Seattle. His very first task upon arriving at the office is to find out who ate his boss’s donut. From there, Jones begins a quest to find out exactly what it is this company he works for does. I mean, what is their business. The answer is both surprising and a bit unsettling. Company is the third book I’ve read by Max Barry (Jennifer Government and Syrup being the other two). 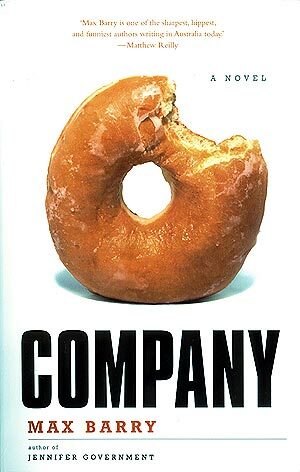 Company follows right on the heels of the others, exploring the relationship between the corporate world and everyday life. In Company, Barry focuses on the employees, the worker-bees in any corporation, and their role in the company’s successes and failures. In particular, he examines how the different aspects of the company — marketing, IT, procurement, etc — work together — or don’t — for the betterment of the company. But, he also explores how corporate culture demands personal sacrifice from the employees in order to maximize corporate success. Barry explores corporate culture by taking it to absurd extremes — or, at least, I hope he does. I can’t imagine working in an environment that he describes. At the same time, while reading Company, I couldn’t help but think that “that’s a lot like where I work.” For example, regarding the different organizations in the company and their relationships to one another, I’ve often thought that there must be someone where I work who’s sole job is to make up new forms, just so I have new ones to fill out. Not because it leads to more productivity, or makes it easier to do my job, but just because. Just because someone has a job to make forms. By lampooning corporate culture, Barry exposes some of the trends that are really disturbing once you think about them. I won’t go into details because I think it would spoil the plot, but suffice it to say that by painting corporate life in an absurd extreme, Barry offers insight into just how corporate culture is affecting us, both as individuals and as a society. I really enjoyed the novel and highly recommend it, both for its entertainment value and its perspective on our market-driven society. I’d really like to hear what people who are in large, multinational corporations think about this book. Barry himself used to work at HP. Any HPeons out there willing to give their thoughts? 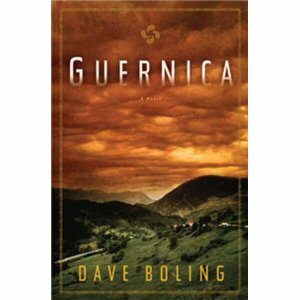 I just finished Dave Boling’s Guernica, a fictional account of the bombing of Gernika through the eyes of two families and three generations of Basques in and around the town of Gernika. 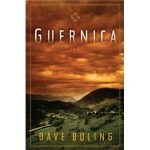 I’ve posted about this novel, which I highly recommend, on my Basque site.